José Alves, CESAM & DBio member, is one of the organizers of the thematic BOU-British Ornithologists’ Union Annual Conference on “Tracking migration: drivers, challenges and consequences of seasonal movements”. The organizing team is composed by researchers from other four institutions: University of Iceland, University of Amsterdam and Centre for Ecology and Hydrology (UK). Recent advances in tracking technologies have allowed us to quantify migratory movements throughout the annual and life cycles in greater detail than ever before, leading to a renewed widespread interest in the field. 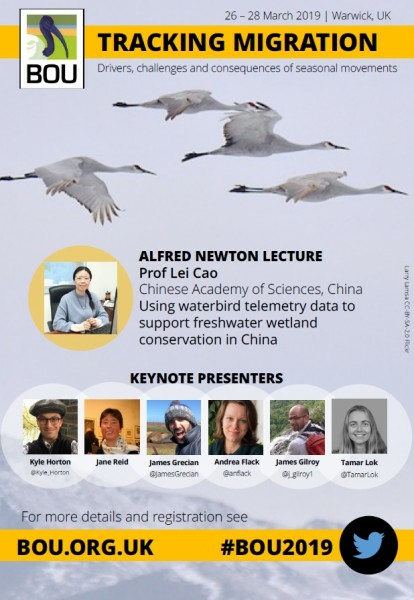 This conference will therefore bring together ecologists and biologists tracking migratory birds in any form, to explore our understanding of avian migration through the use of any tracking technique: from large scale migratory pulses and fluxes to individual variation in phenology and routes; the implications of behavioural flexibility for distribution and demography of migrants (connectivity and fitness trade-offs); and the development and maintenance of migratory strategies at the individual (ontogeny and life-long tracking) and population levels (partial migration and transgenerational changes). The meeting will take place in the University of Warwick, UK from the 26th to the 28th of March 2019.